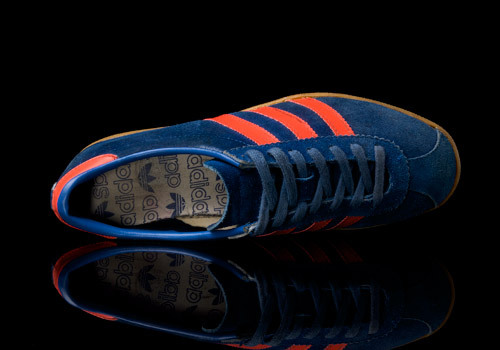 It comes as no surprise that the adidas Dublin is probably the most memorable model from the European City series simply because of the beautiful deep blue suede upper and the striking orange leather stripes and heeltab. The model has been a major hit ever since its original release in 1976 and has seen more than a few re-issues since then, most of the earliest versions being made in Romania, Yugoslavia, and West Germany. 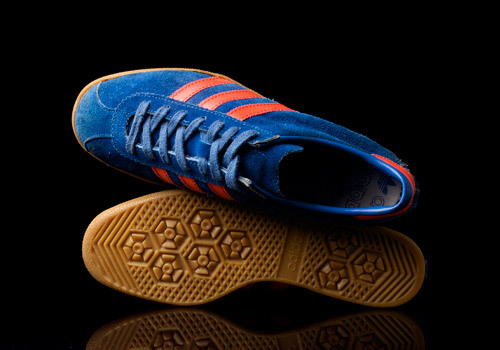 There was also a very rare Dublin released during the 80′s, instead of being blue and orange it was all blue and featured an icy looking sole. 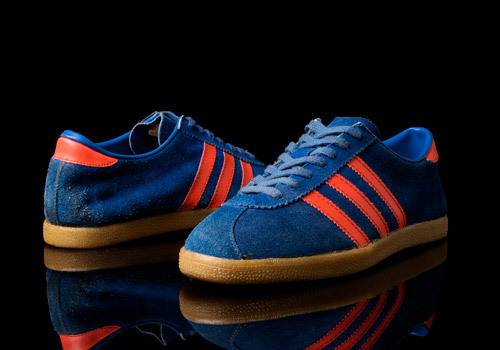 In 2001 adidas once again released the Dublin. 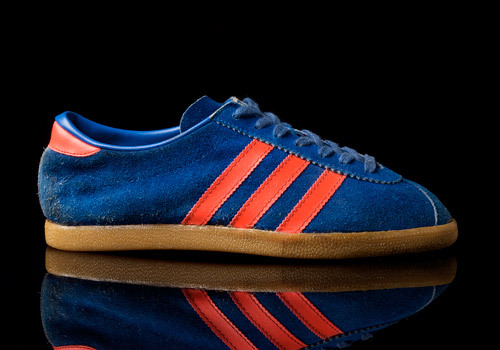 Whilst the tongue on the Dublin’s is usually all suede, this version featured the dimpled tongue that most other city series models have, and the stripes were a slightly brighter shade of orange than usual. 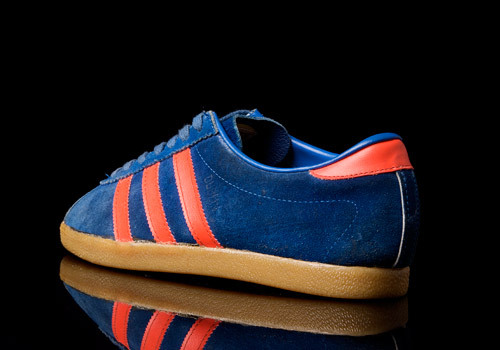 The City series in 2008 introduced the model to the trainer market once again, and the model had the same features as the previous release in 2001 with the exception of an even brighter shade of orange on the stripes and heeltab. Two years later UK based retailer Size? launched their 10th anniversary adidas City series, releasing a certain model in select stores across a selection of cities, Dublin of course being one of them. 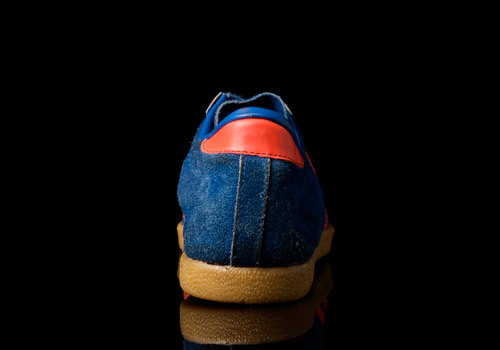 This version featured a leather build with suede details throughout, whilst previous versions had always featured a predominantly suede upper. 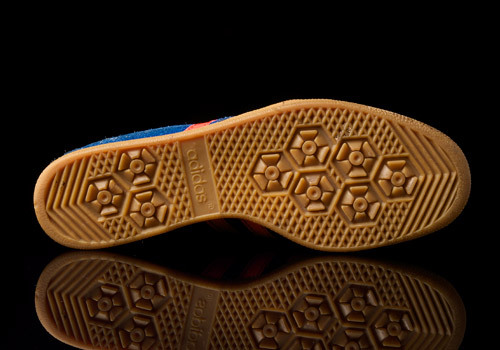 The release was limited to 500 pairs and each pair had the text “1/500″ embossed into the heel stripe. A matching tracksuit top was also available for purchase and only 300 of these track jackets were produced for the release. Regardless of the mixed feelings about the leather version, the release sold out nearly instantly and queues of adidas fans could be found at multiple Size? stores around the country, proving how sought after the Dublin model is and what people will do to get a piece of adidas history.